A studious Christian who speaks fluent Mandarin is Australia's unlikely political hero. Australia's Prime Minister made it on Time Magazine's 100 Most Influential Leaders & Revolutionaries list for 2008. Regardless of whether the list means anything or not, it's great he is making a blip on the international radar. His performance cannot be faulted with so much progress already. I love the fact he can speak fluent Mandarin and that he has assiduously built friendships in China (the only western world leader with this level of understanding), that he apologised to the Aborigines, has a very clever and funny female deputy Prime Minister, bought all the nation's talent together for the 2020 summit to come up with new directions for our country and just appointed a female Governor General. Hopefully our last Governor General ever. Australia is the industrialised nation most exposed to climate change, and most sensitive to China's rise. It must work out how to sustain prosperity for a more diverse population, on a more fragile planet, in a region that will shape the 21st century. 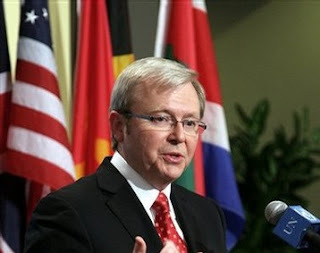 The pressure is on Kevin Rudd. Somehow I think he is more than up for it! Fair dinkum! I wish I could say the same for the USA. We have a village idiot in the office now and I am not sure what we will have when he is gone. cyberbelt - I should have actually said that we had our own village idiot for many years too - an accomplice of your village idiot. So take heart, the future may be better. I agree what happens in your country affects the rest of the world. There is one consolation, it can only be better with someone new, err as long, I guess, as its not another ....... Thanks so much for visiting. WOW WEE, that was a slam dunk post! You are amazing. Extremely informative. I wasn't up on this one. Good to hear about it. You are also an excellent writer. Have missed you; was out of circulation for a bit due to a disastrous week. It's good to be back. Hope all is well with you. Rainforestrobin - great to see you back and hope this week is a better one. Thanks for stopping by. Things are fine with me and am very busy! Take Care. Lilly, that is so funny; I just finished a post on Time's 100 most influential people and then I flipped over to your site and saw this post. Great minds? lol Anyway, I admit I do not know a lot about Mr. Rudd but he seems like a good person and a qualified leader for Australia. I hope whoever becomes the next president of the States will work well with him because I think the relationship between the U.S. and Austraila is very important. We need to continue working with each other and it starts at the top! Anyway, good post. Matt, that's funny I will have to check your post out - definitely great minds...I think it will be interesting days ahead politically - it is going to be tough for any administration. But I am very hopeful here and also for the US too.